Russians are increasingly leaving marriage to a later age in order to focus on their careers and personal interests. While a decade ago 40 percent of weddings were between people under the age of 24, that figure is now just 20 percent. Experts attribute this change to the desire among today’s youth to find a job and acquire life experience before tying the knot. Statistics show that Russians are getting married later and later, with both men and women increasingly postponing tying the knot in favour of developing themselves professionally and following their dreams. According to the Federal State Statistics Service (Rosstat), the year 2013 was the first time in 50 years that the majority of newlyweds – both men and women – were aged 25 or over. The number of men in particular getting married between the ages of 18-24 has plummeted three-fold since 1980. Slightly more than 900,000 marriages registered in 1980 involved a groom aged 18-24, while by 2013 that number had fallen to just over 300,000. Among women in the same age group, more than a million marriages were registered in 1980 and just over 460,000 in 2013. However, although the numbers of Russians who choose to marry later have been growing constantly since 1980, it was the 20-year-period between 1980 and 2000 that saw the most dramatic changes, with the number of women tying the knot between the ages of 18-24 falling by half in the two decades sandwiching the collapse of the Soviet Union. This is significant as it indicates that the trend toward postponing marriage had already begun prior to the fall of the USSR. Since 2000, however, the number of men marrying at 18-24 has continued to fall dramatically, by a further 25 percent, while the statistics for women show signs of beginning to level out, with the number of brides in the same age group declining by 10 percent. The decline in the number of ‘student marriages’ is a natural reflection of ongoing processes in Russian society, says psychologist Natalya Trofimova. “The public mindset has changed regarding civil marriages, which became a completely acceptable norm in our time,” she says. The year 2013 was the first year in 50 years in which the majority of grooms and brides were in the older group (at the age of 25-34), 619,534 and 521,389 accordingly. Young people, particularly those who live in big cities, don’t think it necessary to officially register their relationships. According to Trofimova, motives for getting married usually include love, children, stability, social status, and independence from one’s parents. “Modern students can accomplish almost all of that without entering into an official marriage, instead just going out with someone and living together,” she explains. Nor should it be forgotten that the premium placed on having a career has risen. This is why the majority of people are postponing one of the key events in any marriage – childbearing. Many students, Trofimova says, want to enjoy their freedom and discover themselves before settling down. Family psychologist Maria Romantseva thinks socio-economic and socio-psychological factors have an important role to play in this trend, as they incentivize higher education and career growth. “If you don’t have a higher education, there’s no normal opportunity to get a start in life. Since the time it takes to get an education has increased, it has pushed back the marriage age,” she explains. Liana Shakirova met her fiancé when they were students, “but we decided to wait to get married until we finished studying,” she told RBTH. Liana plans to finish her master’s degree abroad. “We didn’t see the point in getting married and living a year apart. Full-time studies and a family aren’t very compatible,” she adds. According to Romantseva, the opportunity to maintain a family and children is an important factor in getting married. “In the USSR, people were willing to live dependently on their parents for some time, while the current generation is more oriented towards its own livelihood,” she says. Anna Varga, who directs a master’s program called Systemic Family Psychotherapy at the Higher School of Economics in Moscow, says that a key factor behind the changes is that these days marriage and childbearing drastically change a person’s life. “It wasn’t like that in the USSR – everything essentially remained the same after people got married. It didn’t even require much spending to raise a child because there was nothing to buy,” she says. According to Varga, this is a characteristic trend in poor countries, where the birth of a child does not change the life of its parents, which is why there are no problems with the birthrate. 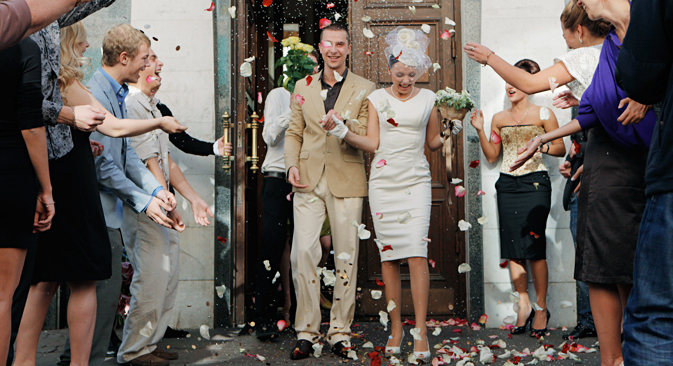 The advent of personal property and savings have given rise to a more responsible attitude towards marriage in Russia. Now a person’s life prospects have a more significant role to play. “People have a clear understanding of how they would like to live and how they could live, and that often isn’t consistent with the idea of marriage. Career-building often implies a certain way of life that is incompatible with a family and children,” Varga says. Furthermore, as life expectancy increases, so too do the periods of childhood and adolescence. “Today’s students are in no hurry to enter adult life,” Natalya Trofimova explains. “The ability to take care of oneself and not financially depend on one’s parents is one of the key criteria of ‘adulthood’,” she adds. Igor and Yevgenia Yashkov met when they were students but decided not to rush into getting married before graduating. Yevgenia cites financial problems as the primary obstacle to marriage. “My schedule was inconvenient, which made it hard for me to find work. So I didn’t have enough money,” she says. Americans are getting married later and later. In 2013 the average age for first marriage in the United States was 27 for women and 29 for men, up from 23 for women and 26 for men in 1990 and 20 and 22 in 1960. Igor adds that he wanted to propose to Yevgenia after the couple had tried living together. “In university it’s not clear whether your expectations in life are the same. You might get married, graduate, and find out that you’re actually completely different,” Igor says. “The post-wedding period is magical, when you want to spend all your time together. So you need to live together,” Yevgenia agrees. But the couple didn’t have the opportunity to do so. They were also planning a big wedding ceremony and honeymoon, but their financial situation forced them to postpone the wedding until after graduation. “We didn’t even consider getting married during our studies. We didn’t like what we’d seen when our friends got married as students,” Igor says.